Welcome to Waterpenny Farm! We’ve been farming in Sperryville since 2000. Click Here to sign up for a 2019 CSA farm share! We have pick-up locations in Arlington, Warrenton, Falls Church, and on the farm. Come to the 18th annual Rappahannock Plant Sale! We are looking forward to seeing everyone at this community rite of Spring, on the farm on Saturday, April 27th from 8-2 this year. See our 2019 Plant Sale flyer for details! Our on-farm self serve stand is now open for the Spring season. We have delicious spinach and tomato soup available. We are now hiring interns for 2019. The internship season is from April to November. Our internship program is a wonderful opportunity to earn a living wage while learning about Sustainable Farming firsthand and enjoying a great place to live and work. Check out our internship page, and E-mail us for more information and an application. 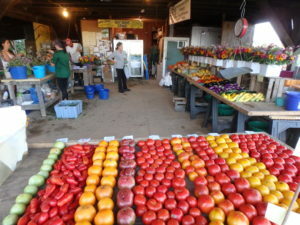 We are at our two farmer’s markets April 18 to November 30. Arlington Courthouse Farmer’s Market is Saturdays 8-12; our stand is at the corner of 14th and Uhle streets. 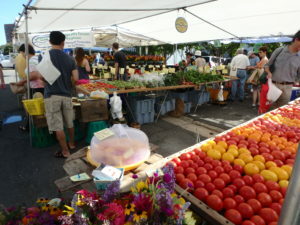 Takoma Park Farmer’s Market, at Laurel and Carroll Avenues in Old Town Takoma Park, is Sundays from 10-2. Click to find out more about us, our ecological growing methods, and news from the farm. Check out our harvest schedule to see a basic outline of what we grow and when it is available. For a weekly box of vegetables in season from the farm, buy a share in Waterpenny Farm CSA (Community Supported Agriculture). 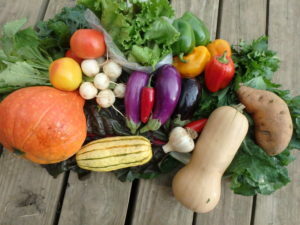 Each year we offer 19 weeks of vegetables from early June through early October. We have Wednesday delivery sites in Warrenton (at Whiffletree Farm), Arlington (at 2323 Washington Blvd. ), and in Falls Church (at 3017 Fairview Park Dr.). Thursday pickup is at our farm in Sperryville. Click Here to sign up for a 2019 CSA farm share! 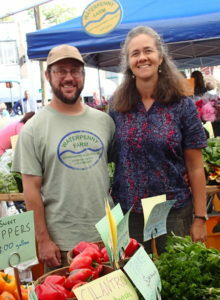 We're Eric Plaksin and Rachel Bynum, and we run Waterpenny Farm.